Interesting homes and interiors are often created by the past lives of the buildings. 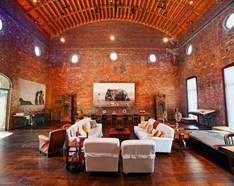 This gorgeous loft in NYC provides a good example. Regarding its past life, the loft has served a lot of different functions. It started out as a place to host dances, conventions and social events. After a huge renovation at the end of the 20th Century, the loft provided space for galleries, restaurants and bars, a lecture hall and a library. Artists also used it as a living and studio space. With its porthole windows, barrel arched ceilings and old wood floors the loft was a perfect choice for all of its former functions. All these elements of industrial design combined with its history make it easy to describe the loft as a one-of-a-kind residence. Right now it's available for sale with a $24 million price tag.